This is a list of the most famous pharaohs. Pharaohs were the kings of ancient Egypt from the First Dynasty (c. 3150 BCE) until the Roman Annexation of Egypt in 30 BCE. The fantastic tombs and monuments that were buit in their honor tell us a lot about their power. 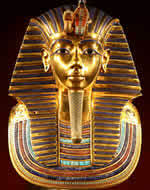 Tutankhamun, also called King Tut was nine years old when he became Pharaoh and reigned for approximately ten years. He is the world's best known pharaoh because his tomb is among the best preserved, and his image and associated artifacts the most-exhibited. In historical terms, Tutankhamun's significance stems from the fact that his reign was close to the apogee of Egypt as a world power and from his rejection of the radical religious innovations introduced by his predecessor and father, Akhenaten. 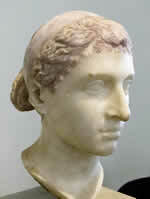 Cleopatra VII known to history simply as Cleopatra, was the last active ruler of the Ptolemaic Kingdom of Egypt. She originally ruled jointly with her father Ptolemy XII Auletes, and later with her brothers Ptolemy XIII Theos Philopator and Ptolemy XIV, whom she married as per Egyptian custom, but eventually she became sole ruler. As queen, she consummated a liaison with Julius Caesar that solidified her grip on the throne. She later elevated Caesarion, her son with Caesar, to co-ruler in name. After the assassination of Julius Caesar in 44 BC, she aligned with Mark Antony in opposition to Caesar's legal heir, Gaius Julius Caesar Octavianus (later known as Augustus). With Antony, she bore the twins Cleopatra Selene II and Alexander Helios, and son Ptolemy Philadelphus. Antony committed suicide after losing the Battle of Actium to Octavian's forces, and Cleopatra followed suit. According to a popular belief, she killed herself by means of an asp bite on August 12, 30 BC. Ramses II, also known as Ramesses the Great, is often regarded as the greatest, most celebrated, and most powerful pharaoh of the Egyptian Empire. He ruled during the New Kingdom for either 66 years. The early part of his reign was focused on building cities, temples, and monuments. By the time of his death, aged about 90 years, Ramesses was suffering from severe dental problems and was plagued by arthritis and hardening of the arteries. He had made Egypt rich from all the supplies and riches he had collected from other empires. 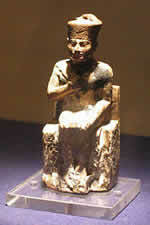 He had outlived many of his wives and children and left great memorials all over Egypt. 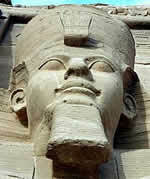 Nine more pharaohs took the name Ramesses in his honour. 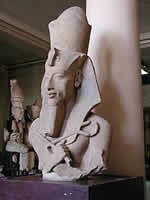 Ramses III is considered to be the last monarch of the New Kingdom to wield any substantial authority over Egypt. His long reign saw the decline of Egyptian political and economic power, linked to a series of invasions and internal economic problems. Ramesses III was assassinated in the Harem Conspiracy led by one of his secondary wives, Tiye, her son Pentawer, and a group of high officials. 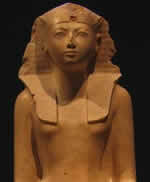 Hatshepsut is generally regarded by Egyptologists as one of the most successful pharaohs, reigning longer than any other woman of an indigenous Egyptian dynasty. According to Egyptologist James Henry Breasted she is also known as "the first great woman in history of whom we are informed." Ramses II was assassinated by his wife. 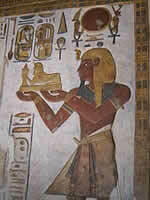 Ramses II was 90 years old when he died. Cleopatra took her own life with the bite of a venomous serpent. Tutankhamun's tomb was discovered intact.